A second day of talks between Turkmen President Gurbanguly Berdymukhamedov and his Russian counterpart has ended at Moscow's Kremlin. Energy dominated the meeting, but other issues were discussed as well. 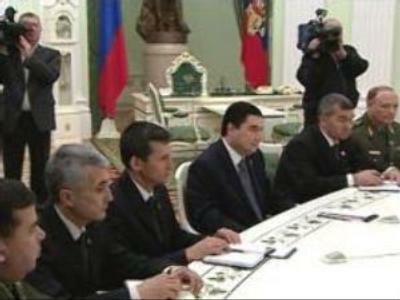 The first visit of the Turkmen leader, Gurbanguly Berdymukhamedov, to Moscow coincided with the death of Boris Yeltsin. This tragic event somewhat overshadowed a meeting that was much anticipated. The fate of Turkmenistan is of interest to many countries. Following elections there, many are asking whether the new regime is just a new version of the old one. The poll raised hopes of change both at home and abroad. For more than 20 years Turkmenistan was isolated because of the policies of the late President Saparmurat Niyazov. “The new President isn't building policy on the cult of personality, as Mr Niyazov did, but at the same time, all we have heard so far is talk about openness and the creation of internet cafes. A lot of actions serve as a demonstration for the West. It's too early to talk about drastic changes,” said Stanislav Kuvaldin, a political analyst. The relations between the two countries during the rule of Saparmurat Niyazov were almost limited to gas and oil. The new leader wants more. “We would like to open Russian language school in Turkmenistan. Also we are starting to build the international university. The idea of such an institution was suggested by late president Saparmurat Niyazov. We would like to invite Russian professors and academics to teach at this university. We would like to open a branch of Moscow State University, if there are no objections,” Gurbanguly Berdymukhamedov said. The former Soviet republic is now the focus of intense competition. Russia, China and the West are all anxious to get their hands on its natural gas. Turkmenistan has around 20% of the world's gas resources. After the death of Saparmurat Niyazov, the U.S. and the European Union tried to persuade Turkmenistan to bypass Russia's pipelines and export its gas through the Trans Caspian pipeline. Gazprom now buys the vast majority of the country's gas, and that agreement is in place until 2028. Both presidents didn't make any secret, energy is a main topic for these talks. “The development of our economic relations is especially important. Of course, the main purpose of our meeting was to discuss progress in gas and oil trade. We talked in detail about the current situation and prospects for the future,” said Vladimir Putin.